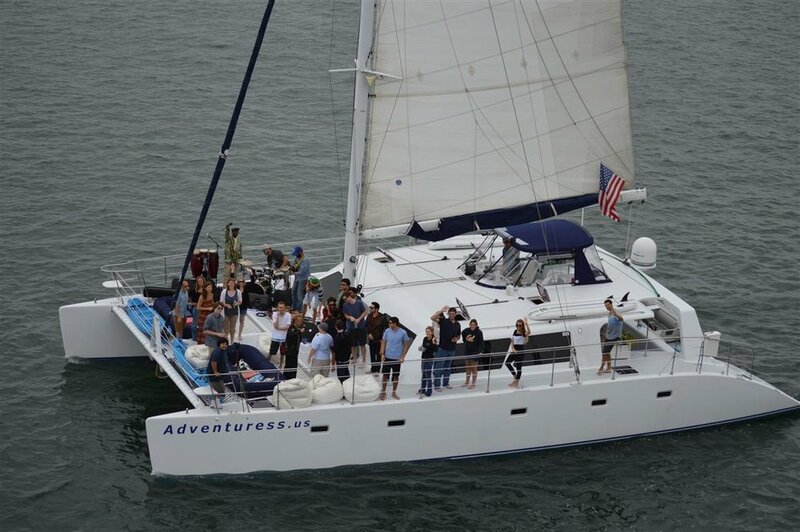 Book with Mai Tai San Diego Yacht Charters for sailing adventures, sunset sails and private group parties on beautiful San Diego Bay. We are here to give you the very best boating experience possible by exceeding your expectations. A mild climate and steady winds make San Diego the ultimate playground for boating of all kinds. From sabots to super yachts, cruise ships to catamarans, recreation to racing, San Diego is the place to get out on the water. Adding sailing to your vacation itinerary is a breeze with numerous charter, rental and instructional services, plus dinner cruises, sport fishing, scuba diving excursions, whale watching and other ocean-going outings. San Diego's affinity for boating has a long history, extending back to early Pacific explorers like Juan Cabrillo who stepped into history as the first European to set foot in California in San Diego bay in 1542. An excellent natural harbor and important stop on the California Mission circuit, San Diego's marine traffic grew rapidly during the colonial period and into the early 20th Century. Even before the Naval buildup during and following the Second World War, San Diego had already established itself in the boatbuilding, tuna fishing and shipping industries. Yachting and sailboat racing were a popular pastime - a continuing tradition that has spawned America's Cup races, boats and crews.